CBS 8Julia Larsen, 17, used her Make-a-Wish to kickstart a charity project. Julia Larsen was given the chance to wish for anything in the world. She chose to give back. 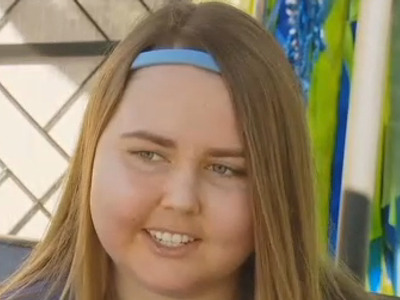 Larsen, 17, was diagnosed with brain cancer during her senior year of high school, CBS 8 reports. And when the Make-A-Wish foundation offered to grant her a wish, the California teen decided she wanted to organise a charity project. Last Friday, members of Larsen’s community gathered to build house frames for Habitat for Humanity, the organisation that builds and repairs homes worldwide using volunteer labour. Larsen got the idea for the project last summer, when she travelled to the Dominican Republic to help build medical clinics. And since her cancer prevented a repeat humanitarian trip, Larsen chose to focus her Make-A-Wish effort much closer to home. Habitat for Humanity said it plans to use the frames to construct 26 homes for veterans in Poway, California. “I figured I already have so much, and I may as well give somebody else the chance to be just as happy,” Larsen told CBS 8.